Excellent condition. Original period frame. 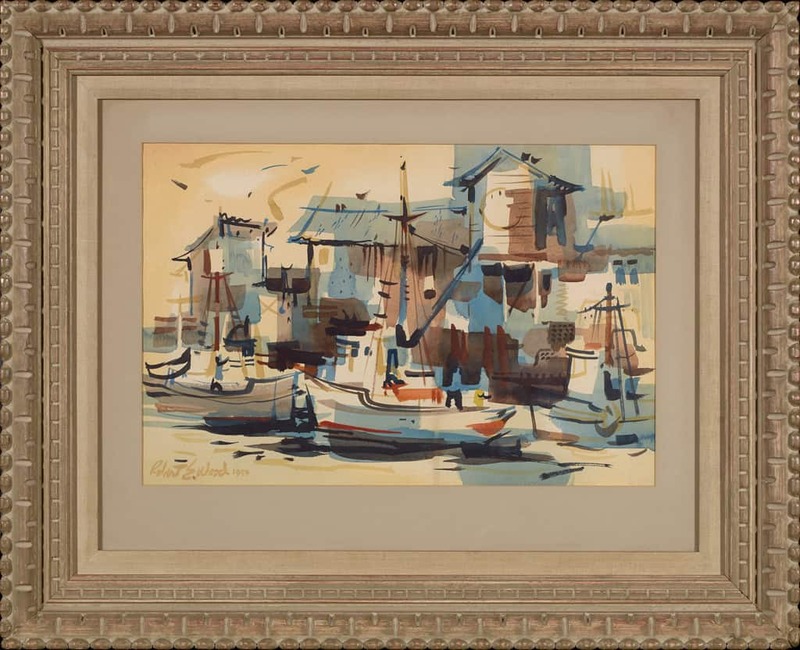 With its style in early abstractionism, while at the same time adhering to representational foundations, this mid-20th-century watercolor painting by Robert E. Wood is a classic example of works created in the post-war era. Wood was part of the California Scene Painting movement (1920-1970), which was inspired by everyday life. 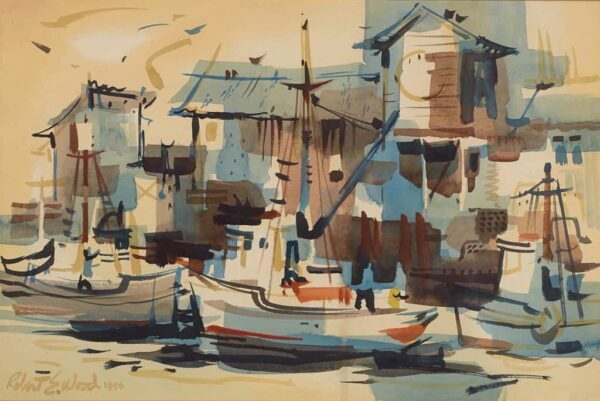 In this painting, Wood portrays the age-old livelihood of fishing as it was in 1959 along the Pacific Coast. Here, tuna boats are set against a backdrop of canneries believed to be in San Pedro Harbor's Terminal Island, Los Angeles. 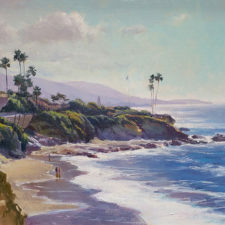 The location was made popular by several California Scene Painters including Millard Sheets (1907-1989), as evidenced in Sheets' painting, Fish Harbor, Terminal Island, 1935. In 1959, the year Robert E. Wood created this painting, the Department of the Interior's Fish and Wildlife Service held a "Tuna Meeting" on July 8 in Washington D.C. with representatives of the Pacific Coast Tuna Industry. The discussion addressed concerns over increased production costs. Suggestions were made that included government assistance in financial loans and conferences with the Japanese government regarding tuna conservation, volume, and price controls. 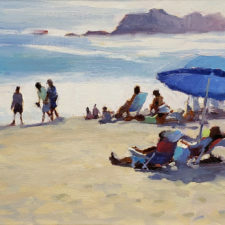 Born in Gardena, California, Robert Earle Wood was one of the main practitioners of the "California Style" and is known for his watercolor landscapes and marine paintings in a semi-abstract approach. He earned a B.A. 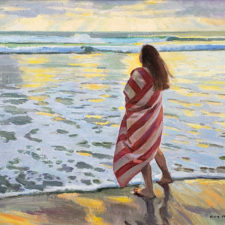 from Pomona College and an MFA from Claremont College where he studied with American Scene painters, Millard Sheets, Phil Dike, and Jean Ames. 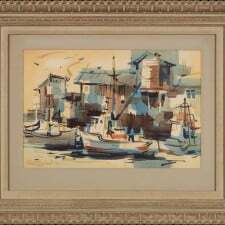 Just after World War II, Robert E. Wood began seriously studying watercolor painting and was influenced by artists Rex Brandt and Phil Dike. By the late 1940s, Wood was in a graduate program and already exhibiting watercolors in museum and gallery shows. 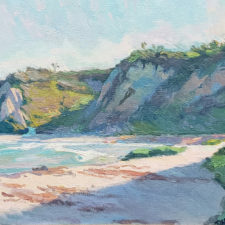 His works from this period often depict regional subjects found near Claremont, where he was attending college, and harbor subjects near Corona del Mar and Newport Beach. 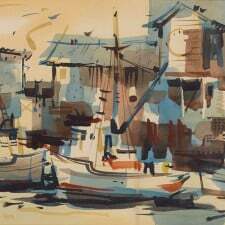 By the early 1960s, he was acknowledged as one of the premier California watercolorists to emerge during the postwar era. The personal style for which be become well-known was clearly developing. 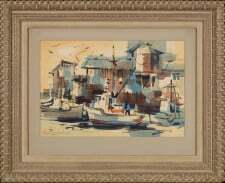 While most of his works have been painted with transparent watercolors, he also freely incorporated opaque colors or other complimentary mediums, if he felt they improved a specific work of art. His paintings often balance areas of pure abstraction with stylized, but recognizable subject matter. Throughout his career, Wood divided his time between painting outdoors and working inside his studio. Sources: Gordon T. McClelland and Jay T. Last, "California Watercolors 1850-1970"; Interview with Robert E. Wood, 1984.